Below is just a sample floor plan layout of what Complete Alarms recommend when it comes to installing your security package. 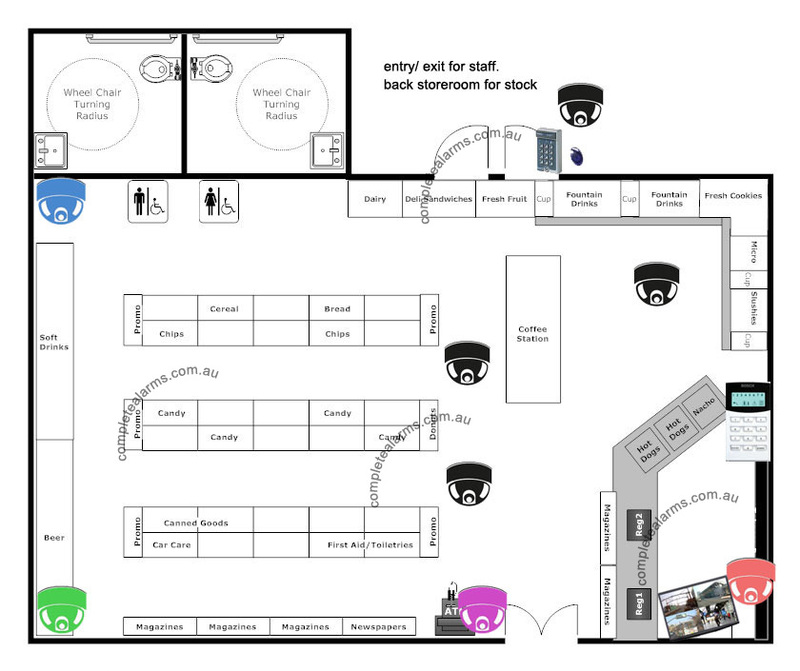 Convenience Store Floor Plan with 8 connected IP CCTV camera surveillance, Bosch Alarm system & staff access control. A high resolution IP camera that can allow you to zoom up to the finest digit details on a dollar bill, will ensure your cash register area is safe from burglary and staff theft. 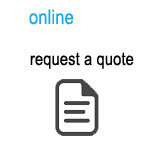 Also, high quality footage will allow for better evidence when reporting incidents to authorities. A requisite to place a camera in a close position to the entrance which allows high visibility of all entrants and departures from the store. Also, it is recommended a camera is placed near all ATM machines. Beverages are the easiest to pinch for the seasoned thief. A camera dedicated to the beverages area will ensure you are not losing your inventory which can add up to hundreds of dollars a month. Another safety camera to allow for high visibility over hidden aisles or the toilet area that cannot be visibly monitored by staff. This will allow staff to immediately respond to incidents should there be unexpected public accidents or small thievery. Additional ceiling cameras will deter further incidents that may cause a loss to your convenience store. It will also allow peace of mind for staff who may be working late or in suburbs with high crime incidents. A high clarity monitor will ensure your staff can keep watch on your convenience or grocery store. 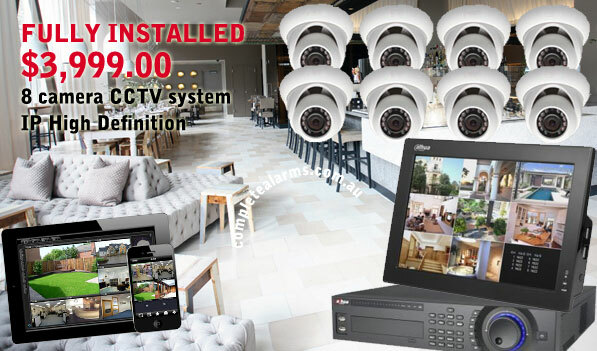 All Complete Alarm CCTV packages comes with a free connection to mobile and tablet devices, so you can view activities on your store from anywhere. 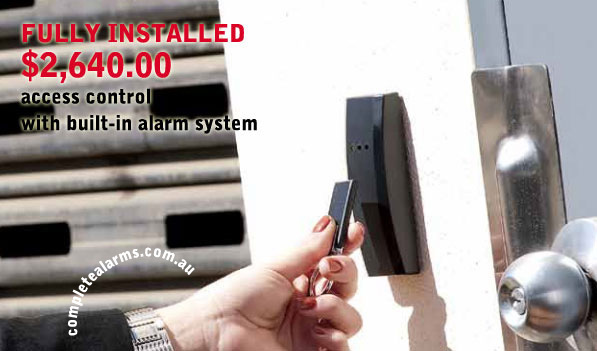 Standard Bosch alarm system will give you peace of mind from any intruders and burglary outside store hours. 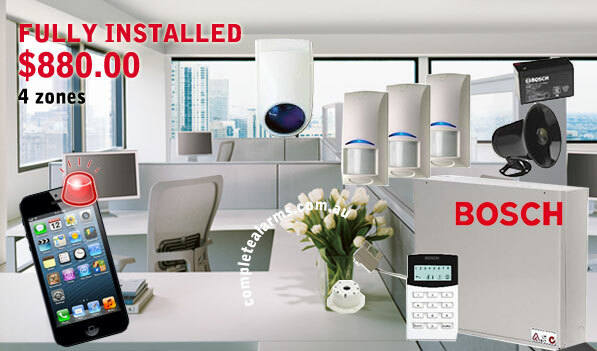 All Complete Alarm installations come with mobile phone alerts when the shop alarm has been triggered. Access control from the main staff entry and exit will prevent unnecessary visitors or intruders to enter your shop from the main back office or storeroom where most of your valued inventory or store valuables are kept. It will also allow you view the time stamp and frequency of your staff’s entry and exit inside and outside normal work hours.